Guercino found! Round up the usual suspects. They already been rounded up, truth be told, but when a stolen 17th century masterpiece is found in Casablanca, the headline pretty much writes itself. 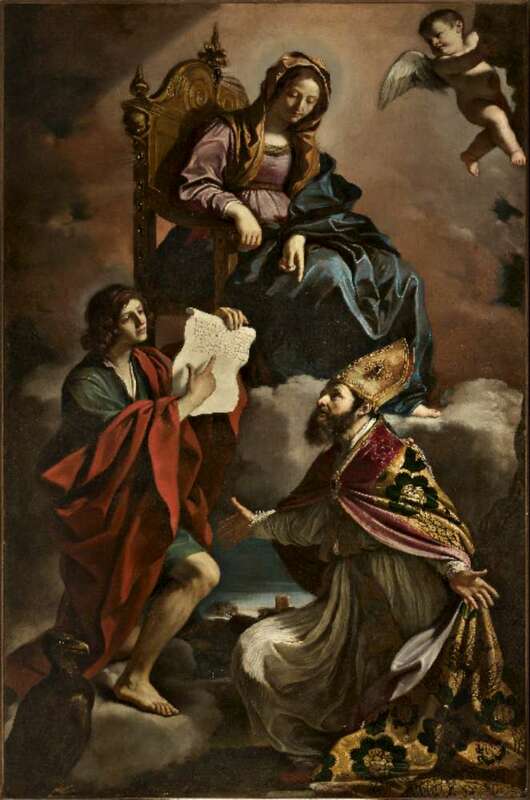 The masterpiece in question is Madonna with the Saints John the Evangelist and Gregory Thaumaturgus, an oil on canvas painted made in 1639 by Giovanni Francesco Barbieri, aka Guercino. For the next 375 years, the painting remained safe in the Church of San Vincenzo in Modena. Even a direct hit on the church by an Allied bomb in 1944 left the Guercino unmolested while the presbytery and the frescoed choir were reduced to rubble. The lucky streak broke in August of 2014 when the painting was stolen from the church, probably the night of August 10th. The theft wasn’t noticed until the morning of the 14th when the priest saw the front door was unlocked. The church is only open on Sunday for mass and the doors are kept locked at all other times. There was no sign of forced entry on the door, so the thieves must have gotten in when the doors were open and hid in the church until the coast was clear. Then they somehow made off with a painting nine and a half feet high and six feet wide still in its huge wooden frame. Police investigated thoroughly, going full CSI on the church looking for any microscopic speck of evidence that might help track the painting and its kidnappers. They also collected hours of security camera footage from the streets around the church in the hope of finding a van or truck large enough to transport so large and unwieldy an artwork. The investigation enlisted the aid of Interpol and local authorities in countries around the world, but came up empty. There was no trace of the Guercino. There was the usual speculation by police and in the press you see every time something huge and famous and therefore virtually impossible to resell is stolen that the theft was commissioned by a villainous private collector. And again as it so often seems to be the case, the real explanation is that art thieves are, as a group, terrible at everything but the stealing (and sometimes at the stealing too). Last week, like a bolt from the blue, Interpol got a call from the Moroccan police alerting them to a large canvas discovered during an investigation, a canvas they believed to be the stolen Madonna with the Saints. A man claiming to be an art dealer had offered the painting for 10 milioni dirham (about $1 million) to a wealthy Moroccan businessman and art collector. He recognized it as a Guercino right away, and since he wasn’t off planet in August 2014, he knew it had to be the painting stolen from Modena. He reported the encounter to the cops. The judicial police of Casablanca’s Hay Hassani prefecture arrested three people, all Moroccan nationals, the ringleader a longtime resident in Italy, for the theft. Interpol alerted the Italian authorities on the evening of Wednesday, February 15th. 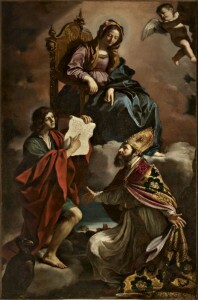 On Thursday, February 16th, Lucia Musti, chief prosecutor of Modena, confirmed “with the greatest satisfaction” that the painting recovered in Morocco was indeed Madonna with the Saints John the Evangelist and Gregory Thaumaturgus by Guercino, stolen from the Church of San Vincenzo between the 10th and 13th of August, 2014. The Italian and Moroccan authorities are working out the details of the repatriation of the painting now. There are no reports yet as to its condition.